Palestinians check the damage caused by an Israeli airstrike on smuggling tunnels in Gaza on Sunday. (CNN) -- Israeli fighter jets attacked what the country said were "terrorist sites" in Gaza in retribution for an earlier attack, the military said Sunday. The Israel Air Force hit two weapons-manufacturing facilities in northern and central Gaza and a smuggling tunnel in the Rafah border area, Israel Defense Forces said in a statement. Gaza shares the Rafah border with Egypt. 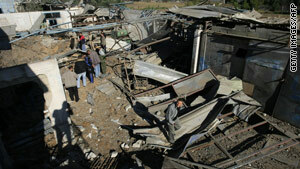 The incident took place overnight Saturday, according to security sources within Hamas, which controls Gaza. Three people were injured, the sources said. Israel added that it targeted the sites in response to the firing of a Qassam rocket at the southern Israeli town of Sderot on Saturday morning. About 15 rockets and mortar shells from Gaza were fired at Israel last month, the military said. About 270 have been fired since the end of Operation Cast Lead, Israel's three-week offensive in Gaza earlier this year, the military said. It added that more than 3,300 rockets or shells were fired prior to the operation. Israel has said that Operation Cast Lead was designed to stop Palestinians from firing rockets and mortars into Israel from Gaza. There is an ongoing dispute about the number of people killed in the offensive. The Gaza-based Palestinian Center for Human Rights put the death toll at 1,419 and said 1,167 of those were "non-combatants." The Israeli military released its own figures earlier this year, saying that 1,166 people were killed, 60 percent of whom were "terror operatives."